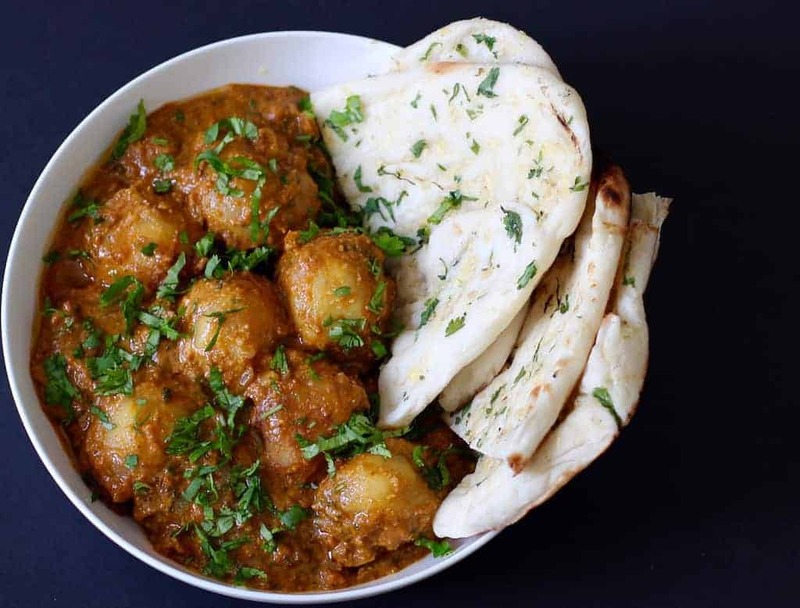 Dum Aloo – A north Indian curry made with baby potatoes simmered in onion and tomato based gravy, spiced beautifully with turmeric, red chili pepper, garam masala and a hint of dried fenugreek leaves! 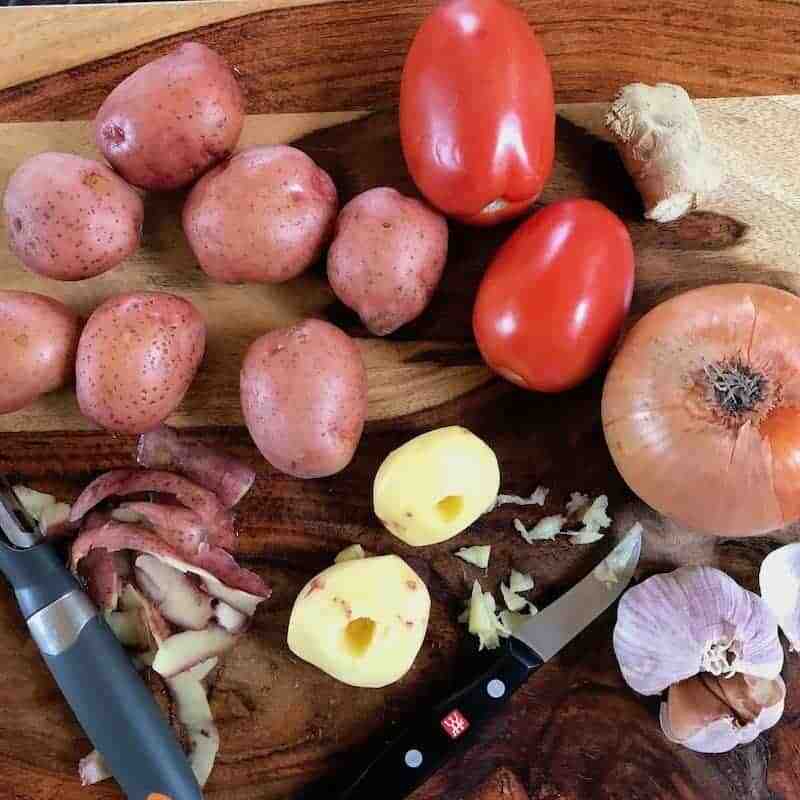 My mom’s signature recipe, that I grew up eating is a combination of perfectly cooked semi-stuffed potatoes, slow-cooked in smooth, aromatic and creamy sauce. I make it frequently in my Instant Pot for a quick, delicious and authentic Indian meal. I truly believe it is the hint of garam masala and dried fenugreek leaves that gives this dish that magic touch. 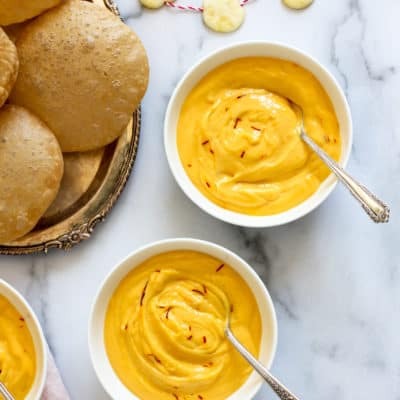 Yes, another creamy, restaurant-style Indian curry but with a swirl of cashew paste added in the end! Peel and core the potatoes. Reserved the cored bits of potatoes as it will be added to the sauce later. Soak cashews in warm milk for 10 mins and set aside. Blend together to make smooth paste and reserve. Set the Instant Pot to saute mode and heat add ghee. Add onions and cook for 2 minutes with a glass lid on, stirring few times. Add ginger and garlic paste, cook for 30 seconds. Add the carved out pieces from the potatoes. Add tomato puree, turmeric, red chili powder, garam, masala and salt. Cook everything on saute mode for 2 mins with glass lid on, stirring a couple of times. With a small spoon, very carefully, as the gravy will be hot, fill the potatoes with the cooked masala/gravy and line them all in the IP insert. Add ½ cup of water. Close the Instant Pot, set on manual/pressure cook(Hi) for 8 minutes followed by Quick Release. Open the Instant Pot and stir in dried fenugreek leaves, cashew paste and chopped cilantro. Set the Instant Pot to Sauté mode and mix everything together. Add salt to taste. Bring to gentle boil and then turn the Instant Pot off. 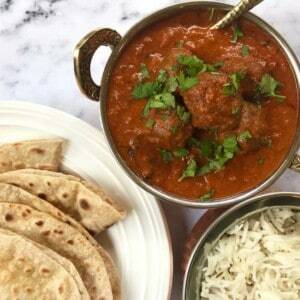 Serve with hot parathas. substitute ghee with cooking oil. 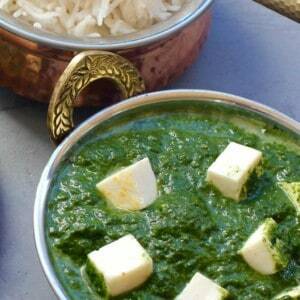 If you have enjoyed my palak paneer, butter chicken and aloo gobhi recipes, I would say give this recipe a try and you will be obsessed! As always, you can adjust the red chili powder and garam masala to make this dish more or less spicy. 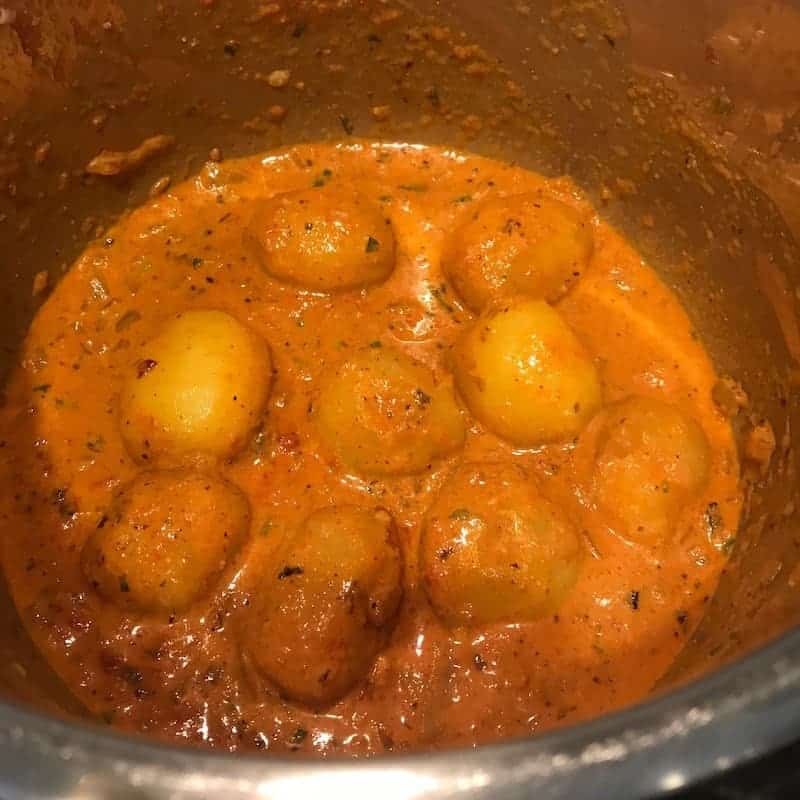 Baby potatoes simmered in smooth, creamy and mouth watering sauce! Soak cashews in warm milk for 10 mins and set aside. Blend together to make smooth paste and reserve. Set the Instant Pot to saute mode and heat add ghee. Add onions and cook for 2 minutes with a glass lid on, stirring few times. Add ginger and garlic paste, cook for 30 seconds. Add the carved out pieces from the potatoes. Add tomato puree, turmeric, red chili powder, garam, masala and salt. Cook everything on saute mode for 2 minutes with glass lid on, stirring a couple of times. With a small spoon, very carefully, as the gravy will be hot, fill the potatoes with the cooked masala/gravy and line them all in the IP insert. Add ½ cup of water. Close the Instant Pot, set on manual/pressure cook(Hi) for 8 minutes followed by Quick Release. Stir in dried fenugreek leaves, cashew paste and chopped cilantro. Set the Instant Pot to Sauté mode and mix everything together. Add salt to taste. 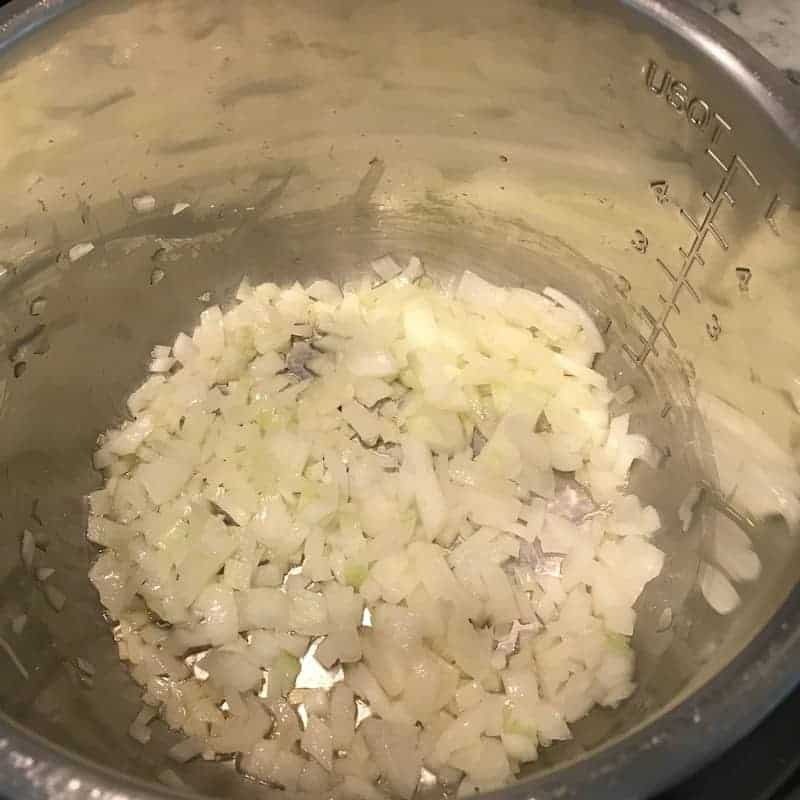 Bring to gentle boil and then turn the Instant Pot off. 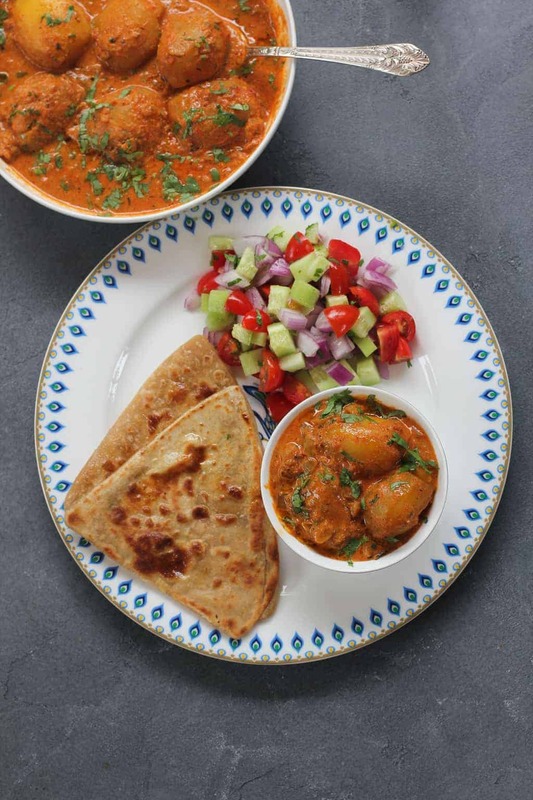 Serve with hot parathas. 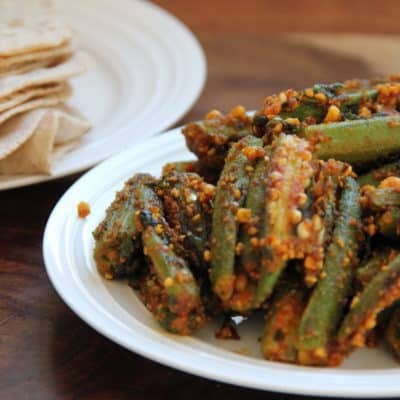 Love this recipe Archana – gives me an excuse to buy some of those dried fenugreek leaves I’ve seen in my local wholefoods store! Hi Laura! Thank you. Yes I am also so happy that whole foods is carrying all these spices. There are few other recipes on my blog that use dried fenugreek leaves so they will def be useful. They give indian curries a restaurant-like taste. Hi Archana I made this yesterday and wow! Amazing sauce and I’m so glad I made a big batch with some now in th freezer for my next Indian feast. My husband, whose mum is an amazing Gujarati cook, said it was fantastic too ?? Hi Laura, SO glad that you and the family enjoyed this. It is a big compliment coming from your Gujarati mom in law!! Thank you. Comes out so delicious so such less efforts right? You can also stir in peas in the end if you like. Absolutely amazing dish! Loved every bit of it (and unfortunately ate the whole pot all to myself). Easy, flavourful, and just wonderful. 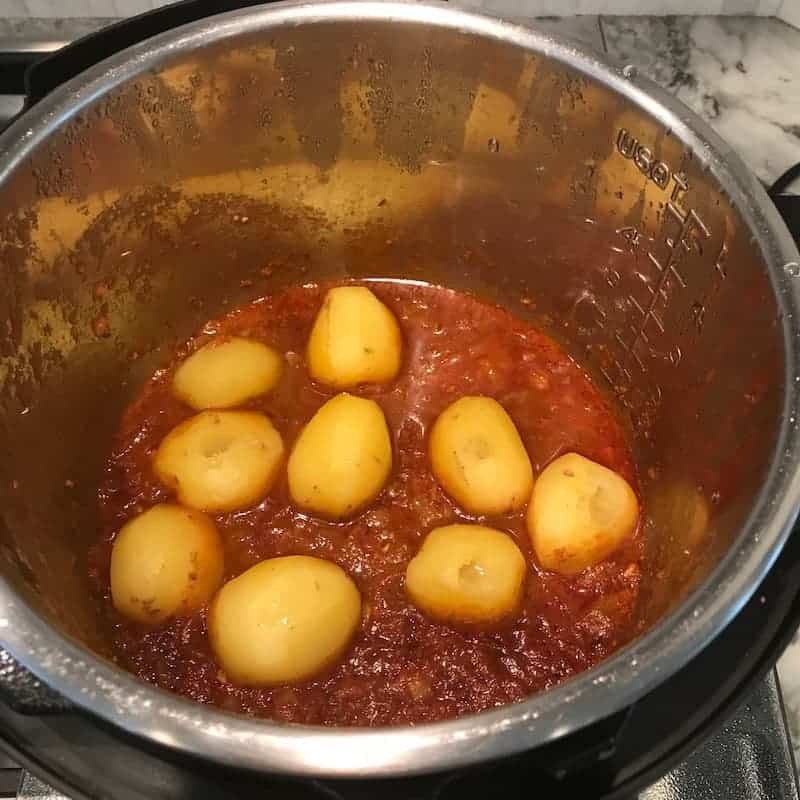 Next time, I feel like cutting the potatoes in half and put them in without peeling (I had really tiny potatoes); the skin is nutritious and tastes good in the IP. So does your Chicken Korma I made last night. Thank you for all these great recipes!!! Thank you Lousie! So glad that you are enjoying my recipes. I agree that the potato skin is nutritious, so cutting them in half will also work well. Thank you Hetal! Comments like these make the time I take to perfect these recipes so worth it. Thank you. Thank you. Hi Laura! It warms my heart to hear that you enjoyed this recipe. I feel honored that you dedicated your blog post to it, and I love that we share the same love for these recipes. Thank you! Thank you!! I’ve just seen your sauce on Laura’s blog, and it does sound lovely. I take it it can be cooked in a saucepan, I don’t need to use an instant pot? 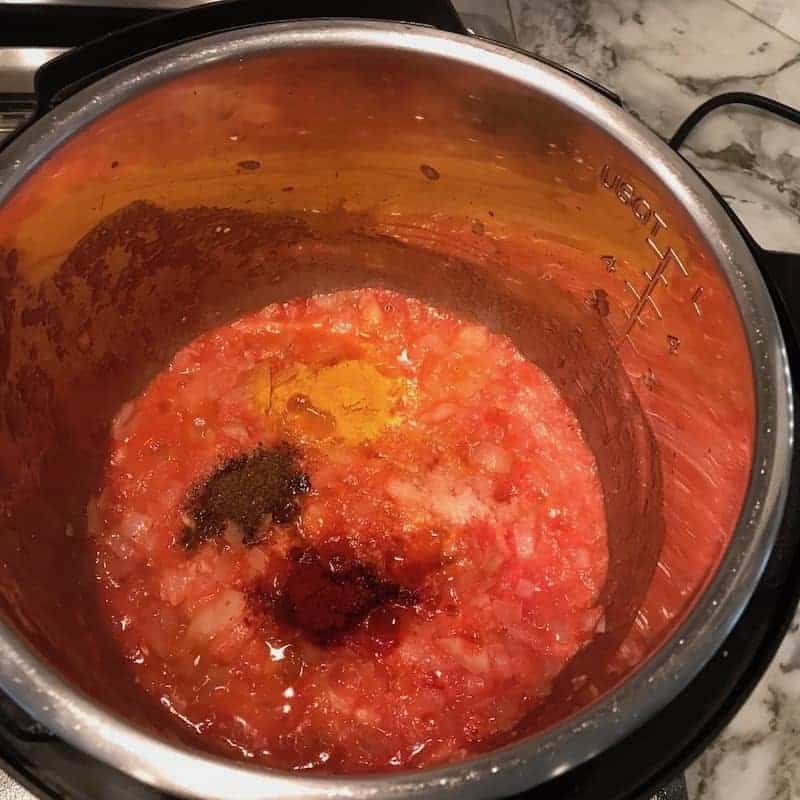 Hi Elaine, yes do not need a instant pot. It can be cooked in a sauce pan. Let me know if you have any questions. I will be happy to help! Made this per your instructions, and loved it! Finally found THE dum aloo recipe! This one is definitely going into my list of faves for parties! Thanks so much for sharing, I’m a huge fan! Thank you Noela! I am SO glad you enjoyed this easy and authentic tasting recipe. 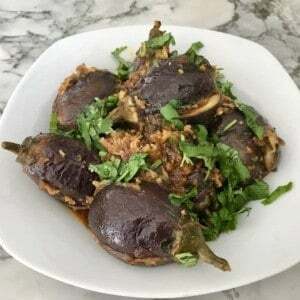 Hi Archana I love this recipe and have tried it tonnes of times . I am planning to make it for my girl’s birthday for about 25 guests. Should I just increase the proportions based on the servings or do you hve another suggestion? How much can I make in IP at a time. Hi Sai! I think you can easily increase all the ingredients by four times. Your initial sauté time will increase but the pressure cook time will still remain the same. This dish also tastes better the next day so you can also make this ahead of time and then reheat before serving. Hope this helps. And wishing a very happy birthday to your daughter! Hi Archana. I had the same question as sai and im glad to see your reply. I’m planning to make for around 20 guests and I wonder if my IP duo plus 6QT can accommodate the sauce and around 35-40 baby potatoes? Also I don’t have an IP glass lid but have regualr kadai glass lid. Can i use this lid? Kindly reply. Thank you archana.. Will update you once I make this today. Hi Archana. I had used around 45 baby potatoes and IP couldnt generate pressure at all. the gravy was sticking to the base even though after deglazing pot. 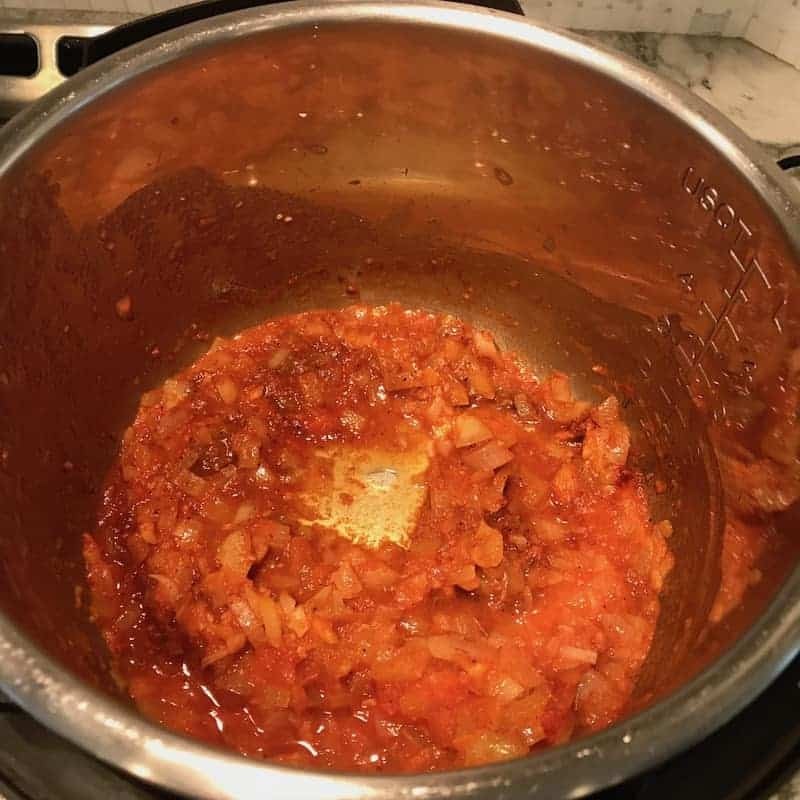 I even moved entire content 3 times to different kadai and washed the inner pot after scraping all brown bits but even then the IP could not generate pressure. I did add sufficient amount of water but still gravy was getting stuck at the bottom each time. Finally I had to move the sabzi to a normal pressure cooker and it turned out to be good. Hi Priya, Sorry this didn’t work out. I guess with starchy potatoes and the fact that the Instant Pot insert does not have too much width, it must stick to the bottom. I have only doubled it in the pastor 20 potatoes. But we know now for the future. Hi Archana, this looks like a fantastic recipe. One question – do you have a recommendation on a substitue for the cashews? We have treenut allergy in the family. Hi Anjum! Unsweetened coconut cream or low fat cream makes a good substitute for cashew cream. Hope this helps. Archana – how much of the coconut cream would you recommend? 2-4 tablespoon (depending on the creaminess you desire) of unsweetened coconut cream will work. Hope this helps. Can’t wait to hear how you liked this dish! I plan to make this for our Diwali spread tomorrow. Quick question. My daughter doesn’t have dairy so I want to replace milk with almond milk (or another substitute). What is your recommendation? Hi Stuti, you can soak the cashews in warm water instead of milk to make the cashew paste and use it. How do u carve out the baby potatoes? I have a small ‘curved pairing knife’ that makes the coring easier. But I sometimes also just cube large potatoes and use them in this dish. It is equally delicious. Let me know if you have any questions. Double all ingredients! Just sauté time will increase but same pressure cook time! So glad you enjoyed this. I will have to keep telling my mom how much everyone is loving her recipe! Let me know how the doubling works out!! I got home late after a busy day, wondered what I was going to eat. I found some potatoes that needed cooking. 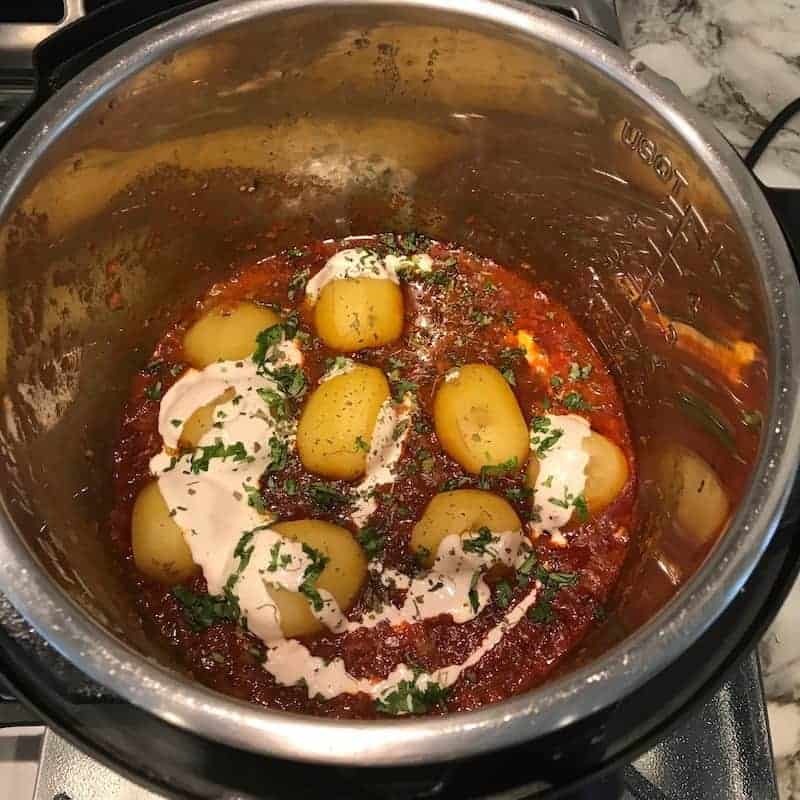 Searched on aloo instant pot to see what I could find. Found this recipe, saw I had most all the ingredients, so I tried it. I made it vegan by substituting water for the milk and the ghee. It still came out so delicious! Thank you so much for this recipe. You say it’s even better the next day so I am restraining myself from eating it all right now! Thanks Archana and Archana’s mom too!! Hi Pat! I am SO happy to see this note from you. It truly makes my day when I see my followers enjoying the recipes I work on. I will surely pass on your message to my mom. AndI hope you have some leftovers for today. If not, double the recipe next time! 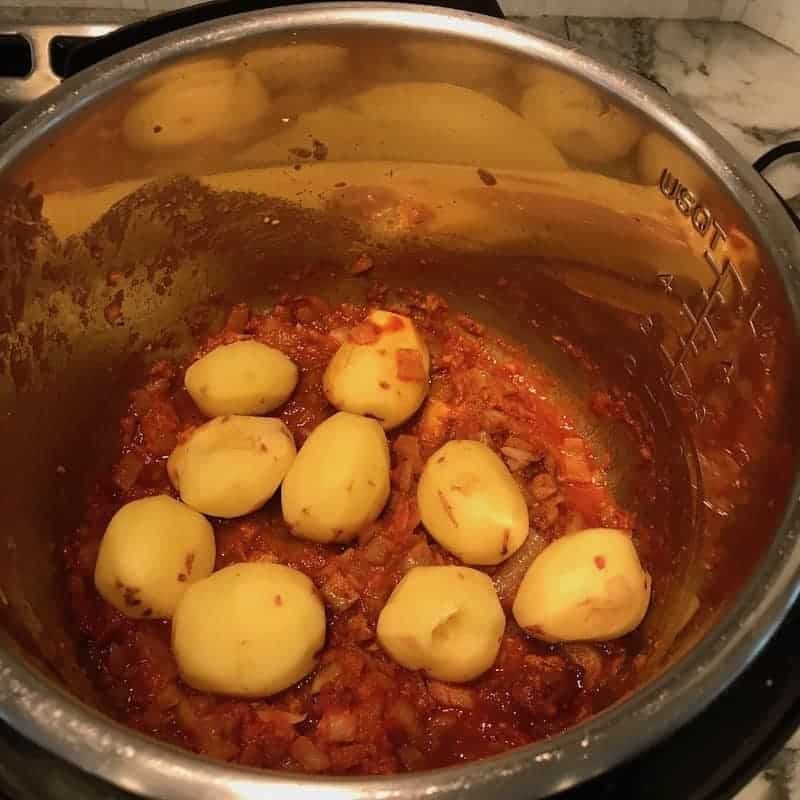 Hi Archana…I have aloo dum following the recipe couple of times and it has always turned out very nice..but this it became very spicy…any tips on how can I reduce the spiciness? 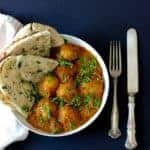 Archana, I’ve used your recipe to make Dum Aloo on a couple of occasions. I must say… it came out AWESOME! The combination of ghee and fenugreek leaves does the trick I feel. Thank you for sharing your knowledge and taking the time and pain to post detailed, easy-for-dummies-like-me friendly recipes. Keep’em going. Hi Rahul, Thank you so much for your lovely note. I am so glad you are trying out all my recipes. I hope you will try more recipes and enjoy them! You are welcome Kruti! Thank you for your lovely feedback. Liked this creamy greavy. We usually prepare this recipe in light greavy. The taste of the recipe greavy shared by you is fabulous. 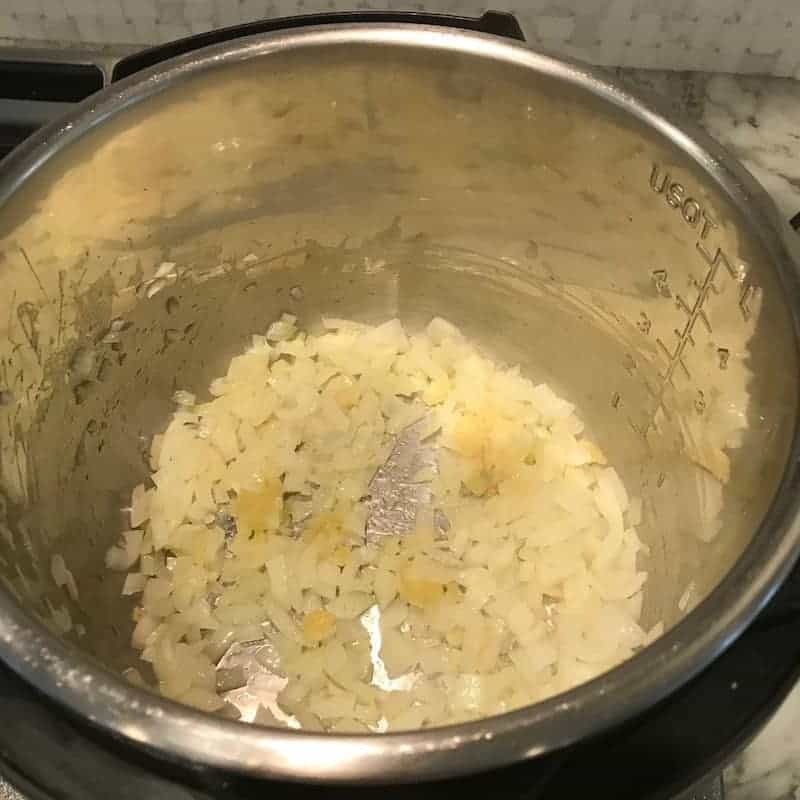 What is I only want to boil the baby potatoes by itself in the instant pot. WHat are the instructions for that? How many minutes to pressure cook it? Thank you so much! Add 1 cup water in the main pot. Then place the trivet and put potatoes over the trivet. Depending on the size 6 to 8 mins of pressure cooking with natural pressure release will work. It turned out awesome! I made a larger qty and I was careful to add the cashew paste later.Didnt burn thankfully and came out amazing..thank you so much!!! !